After the 1st wave, only darkness remains. After the 2nd, only the lucky escape. And after the 3rd, only the unlucky survive. After the 4th wave, only one rule applies: trust no one. Now, it's the dawn of the 5th wave, and on a lonely stretch of highway, Cassie runs from Them. The beings who only look human, who roam the countryside killing anyone they see. Who have scattered Earth's last survivors. To stay alone is to stay alive, Cassie believes, until she meets Evan Walker. Beguiling and mysterious, Evan Walker may be Cassie's only hope for rescuing her brother--or even saving herself. But Cassie must choose: between trust and despair, between defiance and surrender, between life and death. To give up or to get up. This is one of my favorite books. I haven’t read it in a while, but am planning to reread it soon. I love the plot line. It has so many plot twists and I love following all the characters stories. I love Evan and Ringer. I feel that all the characters are very well developed. ALIENS. That's all I have to say. There may be some minor spoilers but not enough to give anything away. 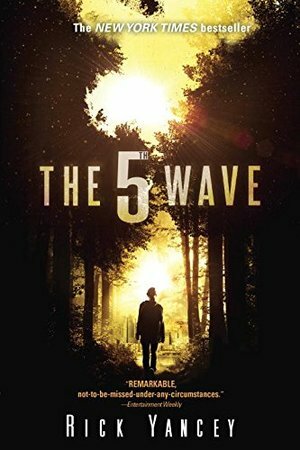 The 5th Wave is step 5 of the alien invasion on Earth. The first wave was wiping out anything electronic or battery powered. No cell phones, no cars, no TV, no lights, etc. The second wave is earthquakes and tsunamis creating literal waves to take out any human populations on the coast. The third wave is a plague that was carried by birds and wiped out about 97% of the population. The fourth wave is the Others, who are now on Earth, using human bodies as hosts and killing out the rest of the human race. And now the 5th wave is coming! The story follows our main character Cassie who is trying to make it on her own during this alien invasion. But when her brother is taken to a camp, she promises to be there right behind him but she quickly learns that they were lied to, and the people who took him are not who they say they are. Now, Cassie has made it her mission to find her brother. I went into this book almost blind. The only thing I knew about it, was that it was about an alien invasion. I HATE aliens. Ever since I saw E.T. when I was very little, I have been terrified. But this book is not what I thought. The aliens are not what we typically picture. They use human bodies as their host, so they look just like us. This story had me gripped from the beginning. It’s so action packed and I loved it! I, of course, did have a couple of issues with it. The relationship between Cassie and Evan is weird to me. I know lots of people LOVE Evan. I like him too, but Cassie doesn’t trust ANYONE. And yet, Evan comes along and saves her, and she’s cool with him. Ummm… Also, at the end with Ben kissing Cassie… why? Why did he do that? He doesn’t even remember her from high school so why does kiss her? Also, I’m pretty sure he heard Evan tell Cassie that he loved her, so he knows she’s got something going on with him. I’m confused with this whole thing now and I really hope there isn’t going to be a love triangle between the three of them in the next two books. But I may be getting my hopes up. Ben is great and all but he’s not for Cassie. I also, think that Bear (Sammy’s stuffed animal) is very motivational for her. It pushed her to keep going and to keep fighting to find her brother. I love all the remarks that Cassie makes towards it and how she seems to hate it. But she never leaves it behind. I highly HIGHLY recommend this book. It was great and kept me really entertained and on the edge of my seat. It is for sure one of my favorite reads this year and I can’t wait to start the next one. Unique idea, great story, flat characters. I couldn't relate to the characters. It was like I was reading a cookbook instead of fiction. The story intrigued me enough to start book 2, but ended up abandoning it about a quarter of the way in for simple lack of interest to continue reading. Oh well, on to the next adventure. I loved this book and I'll probably read the second one to continue my interest in the plot line. This book was the most unbelievable story in the most believable way. The story itself is fascinating and absolutely captivating. I didn't exactly like all of the different plot lines and odd timeline of flash backs and present time, but when the story lines started crossing paths it all made sense. It was hard to follow at the very beginning, so I would recommend to anyone to make sure to get past the initial background to the story to really get into the meat of the plotline. The story itself is about an alien invasion (I know, so cheesy) but it's a very intelligent new take on how highly intelligent species would interact with our civilization because, the truth is, they would be much more intelligent than us and we wouldn't see any of their attacks coming nor would we be prepared for it. This is a wonderful story of a girl who was lucky in the beginning to survive and then quickly realized that she then needed to be strong and ruthless, as luck would run out for the few survivors very soon. Heads up: the ending might make you angry, as it is abrupt and leaves much to be desired. Hence why I'll probably be reading the second book in the series. I wouldn't use this book in a K-6 classroom. There is some mature content in it in the beginning of the book and I wouldn't want to recommend it to a child. I would, however, recommend it to a 7-12 student. The mature content is minimal, only spoken about, and wouldn't need to be explained to a teenager. There is also a lot going on, so for younger crowds this book would only cater to someone with the patience and attention span to follow all of the different timelines and separate narritives, on top of the abstract content itself. If I were to use the book in a classroom it would be for studying stories that have different perspectives and why the author does this. Again, only for PG-13 audiences both intellectually and maturity-wise. In the first part of The 5th Wave, we are introduced to Cassie who is all alone in the wilderness after an alien invasion that has killed most of the people on Earth including Cassie's parents. From Cassie's perspective, we see the memories of her family and how they died. The point of view shifts several times after the first half of the book. Ben Parish and Cassie's brother, Sammy are taken captive and trained to kill the alien invaders. There is also Evan, who is one of the "Others." Evan saves Cassie's life and from that point on, the story really takes off. There is lots of action throughout the story and it is very well written. It just isn't my type of story. I probably will not read the sequel.